The eggplant is probably native to India. The original American eggplant, a member of the potato family, was the shape of a large white egg and the same color. The purple variety was developed because it showed bruise marks less and grew larger inside. The best eggplants to use are medium sized, firm, shiny and unwrinkled with no green spots showing at the round end of the eggplant. A green spot indicates that the eggplant is not mature yet. It should feel light when you hold it. Sometimes it's best to peel the eggplant before you slice it. When sliced in dishes, it is best to cut the eggplant and put a good sprinkle of salt on the slices. The pieces should be left for 5 to 10 minutes for the juices to run out. Dry the slices with a towel, turn over and do the same to the other side of the slice. Tomatoes, onions, wine, olive oil, garlic and basil are all natural accompaniments to eggplants. Eggplants are just as good served hot or cold. They cannot, however, be eaten raw. 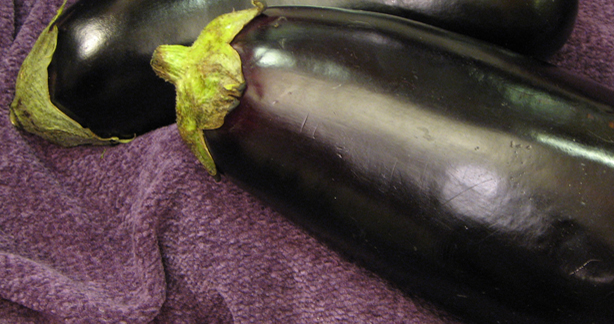 Eggplants are not high in nutritional content. Eggplants are best stored in the refrigerator in a plastic bag. Eat as soon as possible.